The OnePlus 6T is a beautiful, high-end handset that’s far more affordable than its closest competition. OnePlus has forged a reputation for making affordable handsets with premium designs and specifications. The OnePlus 6T is no exception to that. It’s a high-end smartphone, with some fantastic features and hardware at a fairly affordable price. It was the first phone released in the U.S. that includes an in-screen fingerprint reader, which is a feature that’s both fun and functional. It also has an excellent camera with decent night-shot capabilities, and a great-looking display with a tiny teardrop notch. During our testing, it went head to head with big name flagship phones for almost half the price. The OnePlus 6T looks and feels like a premium flagship handset, with a thin bezel and tiny teardrop notch on front, and a pleasantly curved glass back. It’s available in a matte black finish that’s a nice departure from other high end Android phones. The model we tested features the glossy finish, and it’s absolutely beautiful until you touch it. Like most other glass-bodied phones with this type of glossy finish, the 6T picks up fingerprints and smudges. Perhaps the most interesting design choice is that you won’t find a physical fingerprint sensor on this phone. OnePlus decided to go with an in-screen fingerprint sensor that, combined with the teardrop notch, results in a remarkably thin bezel all around. This marks the first time that a phone with this technology has been sold in the United States, but it won’t be the last. Even if you don’t pick up a 6T, you should expect to use this type of fingerprint sensor on upcoming phones. OnePlus decided to go with an in-screen fingerprint sensor that, combined with the teardrop notch, results in a remarkably thin bezel all around. The other design touch that sets the 6T apart from other phones is the signature physical Alert Slider. The slider is located right above the power button, allowing you to instantly set the phone to vibrate or mute the ringer altogether. That said, OnePlus did remove a few one thing from the 6T that fans of the brand won’t be happy about—namely the headphone jack. This means you can’t use your standard wired headphones that plug into the 3.5mm headphone jack. Fortunately, you will find a USB-C headphone adapter in the box in case you don’t have a set of USB-C headphones ready to go. Another option is to get a pair of Bluetooth buds. Water Resistance: No official rating, but why? When you hold the 6T up against the more expensive flagship phones that it matches in terms of performance and style, the biggest question is why OnePlus doesn’t have official dust or water resistance rating attached to this handset. According to OnePlus, the 6T would qualify for IP67 certification, which means it’s water resistant enough to handle the occasional splash or walk in the rain. However, OnePlus refuses to pay for the costly certification process. It may seem strange to buy a high-end phone that doesn’t have an IP certification in a world where obtaining that type of certification has become the rule, but you don’t need to panic if you get caught in the rain, your phone should still be fine. The OnePlus 6T is an Android phone, so you need a Google account to get it all set up. If you have your account information at hand, the phone is pretty much ready to go out of the box. There was a security update available when we fired ours up to start testing, but we were making calls and browsing the internet within minutes of unboxing. 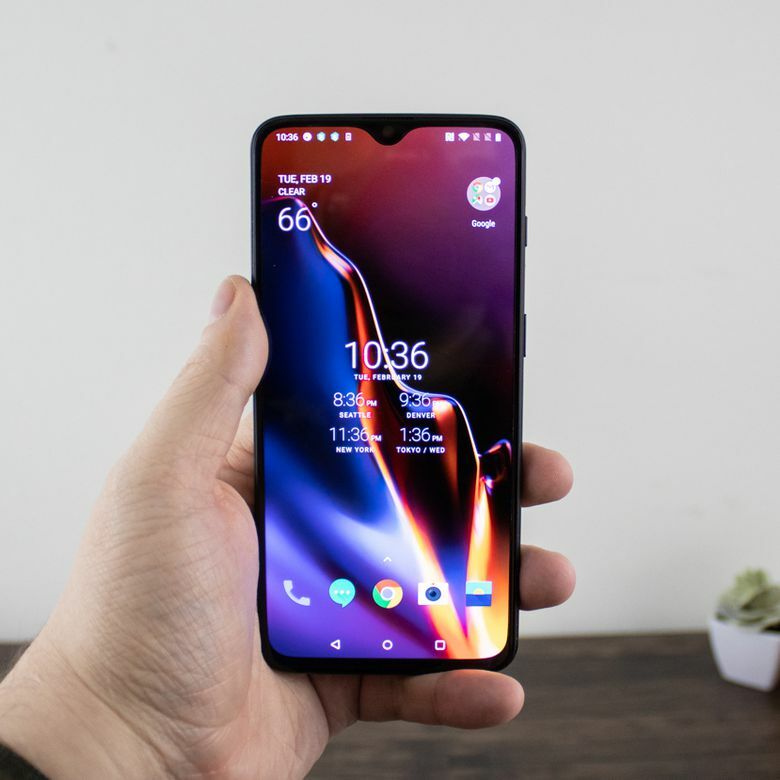 The OnePlus 6T packs the same Snapdragon 845 processor found in more expensive handsets like the Google Pixel 3XL, Samsung Galaxy S9 Plus, and Sony Xperia XZ3, and it compares very favorably in terms of both benchmark scores and real-world performance. The model we tested has 8GB of RAM and 128GB of storage under the hood, but there are even higher specced variants including a powerful 10GB RAM/256GB version. The first test we ran on the 6T was the PCMark Work 2.0 benchmark, which tests how well a phone is able to handle basic productivity tasks like web browsing, email, word processing, and even editing photos and videos. It achieved a great score of 8,527, which is only slightly lower than the score of 8,808 that we got out of the more expensive Pixel 3. The 6T is a powerhouse that doesn’t blink at most daily tasks. We also subjected the 6T to a few benchmark tests from GFXBench to see how it handles more intense gaming applications. It was able to achieve an excellent 31 FPS in the Car Chase benchmark, which measures performance during a fullscreen gaming simulation. Then it notched an even better 60 FPS in the less demanding T-Rex benchmark. In real-world usage, we ran into very few problems. The 6T is a powerhouse that doesn’t blink at most daily tasks, like web browsing, sending email, streaming music and video, and even playing games. The only real performance hiccup is that the fingerprint sensor is a bit slow. When you hold a 6T and a Pixel 3 side by side, and activate the sensors at the exact same time, the Pixel 3 springs to life a fraction of a second faster. This isn’t something you’re likely to notice during normal use, but it is a real consequence of the in-screen fingerprint reader. The OnePlus 6T works great when connected to Wi-Fi, and we didn’t experience any problems when connected to mobile data during our tests. The 6T was actually able to achieve slightly higher upload and download speeds, according to the Ookla speed test app, compared to a handful of other devices tested at the same time and the same area. Indoors, we were able to achieve download speeds of about 11 Mbps and upload speeds of 1.19 Mbps when connected to T-Mobile’s 4G LTE network, even while showing less than a quarter of full signal strength. In those same conditions, we were only able to achieve about 4 Mbps down with a Pixel 3, and 2 Mbps down with a Nokia 7.1. Outdoors—tested in an area of decent signal strength and no obstructions—our 6T achieved a maximum of 61.1 Mbps down and 8.62 Mbps up, compared to about 37 Mbps down measured on a Pixel 3 at the same time and in the same location. The OnePlus 6T has a massive, beautiful 6.4-inch, 2340 x 1080 AMOLED display with a relatively thin bezel all around. It ditches the standard chunky notch from the older OnePlus 6 in favor of a much smaller teardrop notch that creates a tiny dimple in the top of the screen. It isn’t a true edge-to-edge display, but it’s pretty close. Some flagship phones, like the iPhone XS and Samsung Galaxy Note 9, have objectively better Quad HD (1440p) displays, but the OnePlus 6T’s 1080p screen is fantastic when compared to devices that are actually in its price range. It also compares very favorably to the more expensive Pixel 3 when held side by side. In fact, it actually seems a bit brighter than the Pixel 3 in side-by-side comparisons of identical pictures and screens in apps like YouTube and Google Play Music. While the OnePlus 6T doesn’t have is a Quad HD screen, it does have a decent pixel density at 402ppi, but it falls far short of competitors like the Pixel 3 XL, which packs in a pixel density of 523ppi into a slightly smaller, and higher resolution, display. The OnePlus 6T does hide a fingerprint sensor in its display, which is a neat feature that isn’t found in contemporary competitors. The sensor relies on light from the screen to work, so you’ll see a fingerprint icon mark its location on the lock screen, and a brief explosion of color when you use it. It’s a fun visual effect, and it’s pretty fast, but the display does need to illuminate for it to work. If the OnePlus 6T scrimps in any department, it’s sound. It only has a single speaker, despite two identical openings on the bottom of the phone that would seem to indicate stereo speakers. The speaker is plenty loud, and we didn’t notice any distortion when listening to music or streaming videos, but you can definitely find handsets that offer a better experience. Since the speaker openings are located on the bottom of the phone, it’s also really easy to block them with your hand when holding the phone in landscape mode. The OnePlus 6T features a dual-lens rear camera with 20 and 16-megapixel sensors, and another 20-megapixel sensor for the front-facing camera. The rear sensors both get the job done adequately, but you won’t get the same quality of shots that you would with a more expensive handset like the Pixel 3 XL. While the OnePlus 6T does have a Night mode, and it does work, it isn’t really in the same ballpark as Google’s Night Sight on a Pixel 3. Low light shots taken with the 6T’s Night mode are much easier to make out, and look a lot better, than pictures taken with the regular photo mode, but shots taken at the same time with a Pixel 3 are less grainy and have better color reproduction. Unlike competitors, the OnePlus 6T doesn’t support optical zoom or wide angle shots, despite having two rear sensors. You do get to record 4K or 1080p video at 30 or 60 FPS, some features like AI Scene Detection which automatic tweaks shots to make them look better, a Pro mode for manual controls, and Slow-motion recording. The battery life of the OnePlus 6T is fantastic. It comes with a beefy 3,700mAh battery, which was more than adequate to run for a couple days of light usage during our hands-on testing. In a stress test with the screen on, and both the Wi-Fi and mobile data connections active, it lasted about 10 hours. With airplane mode enabled, it lasted an impressive 16 hours. The phone supports fast charging (5V/4A), if you use the included charger or another compatible charger, but it doesn’t support wireless charging. The OnePlus 6T comes with Android Pie, but it isn’t fully stock. OnePlus uses their own OxygenOS, which is basically Android with some extra functionality stacked on top. We typically prefer the stock Android you get from Google and Android One devices, but OxygenOS actually provides a surprisingly smooth experience. If you’ve used Android Pie before, you’ll find everything pretty much where you would normally expect it, especially when it comes to system menus. Most of the tweaks you get with OxygenOS are aimed at improving productivity, like swiping left from the home screen gets you a list of your most recently used apps, a place to take quick notes, useful information about battery life and storage space, and more. OnePlus uses their own OxygenOS, which is basically Android with some extra functionality stacked on top. OnePlus is pretty reliable about pushing the monthly Android security updates, and they’ve included some nice features like Adaptive Battery controls and Night mode. It also includes a Game mode that activates whenever you launch a game app, giving you the option to prevent alert interruptions and lock in your screen brightness while you’re playing. Price is where the OnePlus 6T really shines. In its least expensive configuration, with 128GB of storage and the glossy finish, the 6T has an MSRP of $549. If you want the matte finish and 256MB of storage, it goes for $629. That might not be cheap compared to mid-tier phones like the Nokia 7, but this isn’t a mid-tier phone. The OnePlus 6T packs flagship-level specs and features at a much lower price. The bottom line is that the 6T gives you a whole lot of phone for the money. The OnePlus 6T is something of a strange beast when it comes to comparing it to the competition. If you compare it to flagship phones like the Google Pixel 3XL, iPhone XS, and Samsung Galaxy S9+, it falls short to each one in categories like the pixel density of its display, the camera, sound quality, and it doesn’t support wireless charging. But those phones cost hundreds of dollars more than the 6T. In terms of specifications and raw performance, the 6T compares very favorably to what it’s competing against and puts mid-range phones to shame. Want to take a look at some other options? See our guide to the best smartphones. Premium performance and style without an inflated price tag. If you’re in the market for a high-end flagship phone, but you want to save some money, the OnePlus 6T is the phone to buy. If you’re in the market for a mid-tier phone, and looking to spend on the higher end of that range, it’s also worth looking at the 6T as an upgrade, though you can find cheaper options. Product Dimensions 3.9 x 7.1 x 2.4 in.